Everyman is so named as a less extreme alternative to Uberman. Puredoxyk, who named and popularized Uberman, also proposed Everyman (what is now the Everyman 3 variant) as a way to adapt to less sleep more easily, while being more in sync with normal daily life without the need for extreme rigidity in naps. She reported this as sustainable once her child was a few years old, when someone else could watch the child during her naps. By 2008, it had become popular as the “fallback” for failed uberman attempts. It was inspired by the first wave of Uberman attempts after Puredoxyk in the early 2000s, and then again starting in 2007 by personal growth blogger Steve Pavlina’s grueling adaptation log for Uberman. The repeated experience of Uberman attempters was to crash uncontrollably for several hours, every couple days or so. It made sense, then, to convert those crashes into its own schedule with a 3 hour core. This three hour core soon developed a variant with a 3.5 hour core, with advantages in higher nap flexibility/skippability and a slightly easier adaptation due to the larger amount of REM in the core. At the time this was variant was called “Everyman 3.5”after its core length. This may be confusing at times as recent sources (including this site) use the naming convention based on the number of naps (as opposed to core length). Everyman 2 was developed as an even easier variant with a longer core and 2 naps, and Everyman 4 was developed as a superhuman compromise between sustainable E3 and Uberman. E4 is a mere 1.5 hour core and 4 naps. Everyman 4 (and E5) is only sustainable by few individuals with genetic or acquired extreme sleep resilience and/or efficiency. Everyman 1 is a 6 hour core and 1 nap, which can be sometimes observed in modern society. Most people rarely hold strict sleep times, so it is more common to see about 7 hours plus a nap. Strict times allow for greater sleep reduction. It is most useful to consider E1 as a member of the Biphasic category of schedules, due to its ease and as a permissible schedule for under 18 years of age. See Biphasic for a complete description. Occasionally, E1 adaptation is used as a low-risk entryway for future adaptation to E2, E3, or E3-extended. See Adaptation. For what lifestyles is this schedule best? E2 is often chosen by students who are able to nap before, between or after classes. Part-time jobs can also be conducive to this sleep spacing. Full-time jobs can work with this schedule, if you are able to take the first nap right before work (possibly at your office/car) as well as the second one in the early afternoon (see Lifestyle Considerations). The appeal of this variant is bolstered by the relatively tolerable adaptation difficulty with studies and work performance unlikely to be irreparably affected. Finally, this schedule is useful for people who share a bed or room with someone else. It is not too difficult to find a sleep or wake time that can be the same as the other person’s – if they agree to a consistent sleep or wake time. Why does this schedule work? E2 has a 4.5hr core, which amounts to three full 90 minute sleep cycles. This allows plenty of time for all SWS needs to be met even during adaptation, since even monophasic sleepers typically complete all SWS by middle of the night, through their 3rd sleep cycle, as shown in the graph below. This assurance allows for much greater flexibility in core placement with the best placement around midnight. Some core time in the graveyard hours (midnight through 8AM) is recommended for a good balance of REM pressure (closer to 6AM when REM peak starts) vs SWS pressure (peak at 9PM – midnight). Since E2 only has 2 naps (providing 10-15m REM each), at least an hour of REM should be completed in the 2nd and 3rd cycle once adapted. It is recommended for the first nap to be placed squarely in the REM peak of 6-9AM, virtually guaranteeing quality REM sleep for the bulk of the nap. The second nap is best to be placed at an ideal homeostatic distance – you can stay alert for about 6 hours through midday, and then a whole 8 hours awake until core. What does it feel like once adapted? Eliminating sleep deprivation from shortened monophasic sleep, due to inability to sleep for longer. Enjoying the benefits of discipline required to achieve E2, like increased productivity and stable habits. The fact of accomplishing the adaptation, which is more likely than for other schedules. Improved sleep quality, i.e. a much deeper core experience. REM-only naps are often accompanied by very vivid dreams which are easier to remember than dreams during monophasic sleep. This can be useful especially if you are interested in lucid dreaming. Days can feel less distinct, since you’re unconscious several hours less at night. You’ll get up and/or fall asleep when everyone else is asleep, which can be odd. Mentally, on E2 you will get accustomed to this and regain a sense of separate days. What variations of Everyman 2 actually work? Core +30m: This uncommon variant is still called E2, as it is a minor change. 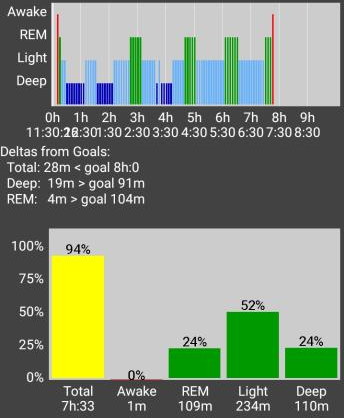 According to about 8 EEG reports compiled by a Polyphasic Sleep Society contributor, the period from 4.5-5hrs in a single sleep appears to consist of REM. We call this a statistically likely REM period. It is important to note that this may vary across individuals and this assertion is currently under review, due to the addition of over a dozen more polysleepers sharing their EEGs with the leading active community on Discord. Early: Core could start as early as 10PM or even 9PM. Rotate naps in sync with the core, possibly increasing gap to first nap by up to 30 minutes, and the nap gap (between nap 1 and nap 2) by up to 2 hours. Late: Core can start as late as 1am, potentially 2am with some basic circadian light and food time management. REM pressure is still relatively low until after 2 or 3AM, so SWS should have no problem entering the early sleep cycles of a late core. What’s more concerning is nap timing; don’t rotate naps equally late unless you are using good circadian management (See Lifestyle considerations). Otherwise, shorten the gaps before both naps 30-60 minutes. On sunlight-based circadian, you want to keep the first nap in or close to REM peak ending by 9AM (latest 10AM), and keep the second nap before 5PM to retain some chance of an afternoon REM nap, and to avoid getting SWS in your evening naps. Either way, neither the wake period between the naps nor the second nap and core should be longer than 8 hours, as that has often caused failures to adapt. Some people did manage to adapt to a gap larger than 8 hours, but this is very rare and is therefore not recommended. Extended: This adds an extra 90m cycle to the core. The only people who should need this are those under 18 years of age, to get closer to a safe amount of sleep (6 hours 40m) for developing brain and body. Teenagers are often sleep deprived already, sleeping 6 hours a night. So, adding a nap before and after school can vastly improve health and quality of life if the core cannot be lengthened due to lifestyle. Note that these naps must be adhered to on the weekend as well, or one might occasionally be skipped with painful and often microsleep-ridden tiredness beginning 1-2 hours after the skipped nap. Shortened: Reducing the core by 90m is not achievable by people with average sleep needs. This would be like E3 with one less nap, when E3 itself is already very challenging. Altered Sleep Spacing: Stretching the wake time between the first and and second nap is popular but not advised past 7 hours, even though many people try to do this to accommodate work or school schedules. 8 hours has been shown to be adaptable for some, especially if you keep busy during this time. Longer than 8 hour wake time usually leads to failure to adapt. 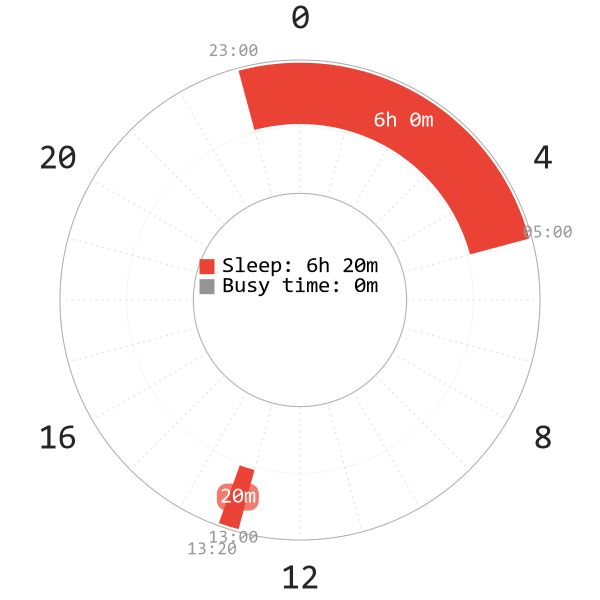 Due to the reduced sleep pressure in the evening on polyphasic schedules, an 8 hour gap in E2 is often only tolerated before the core (as in the recommended version), or at most 9 hours. Similarly, avoid stretching the post-core wake block longer than about 5.5 hours. The sleep pressure during graveyard hours is too high, and/or you may miss the 6-9am REM peak. What is the best adaptation strategy? E2 is typically done cold turkey, or direct from monophasic schedule. It is easier if you’re already been surviving on a shortened (dysfunctional/deprived) monophasic sleep, which is fairly common. The main exception to cold turkey is for people who need 9-10+ hours a day on mono to feel refreshed. Their “lazy”/excessive sleep cycles probably have to be rehabilitated with an easier schedule like E1 or extended E2 first. 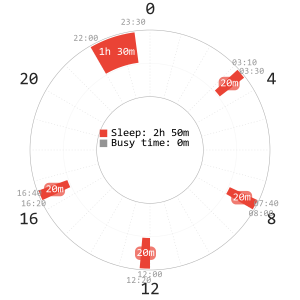 Ideal scheduling: Core starts as close to dusk as possible (around 21:00) to gain more SWS, one nap around 04:00, one nap post-dawn, one early-afternoon nap. All naps should contain REM and little light sleep only. Everyman 3 is now considered one of the most difficult schedules that the average adult should be able to accomplish with strong adaptation skills. Four hours total daily sleep is considered the minimum to contain a sustainable 90m SWS, 90m REM, and transitional light sleep. 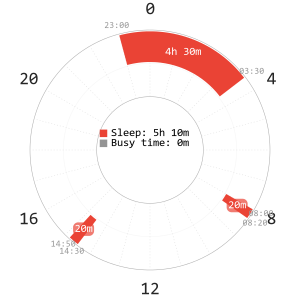 The most important scheduling requirement is having the core cover the circadian SWS peak between 9PM and midnight. 9PM is the ideal start time, but 10PM is also permissible. Rotating the schedule further is very difficult, and requires stringent management of light, food, and possibly temperature cues to maintain a circadian rhythm later than natural daylight. Repartitioning all SWS into only two cycles makes this schedule extremely difficult by the second and third week of adaptation. Eventually, naps should no longer have SWS episodes. The early REM-favored placement of the three naps (none in the evening) helps to reinforce this. 4AM, 8AM, and 2:30PM naps are ideal with a 9PM core. A popular variation of E3 is increasing the core slightly to 3 hours 30 minutes instead of three hours. This eases adaptation, presumably by moving a chunk of REM from the naps to the core. It has also been demonstrated to allow for higher flexibility of nap timing (at least for the second and third nap) on a day to day basis, once adapted. Mechanism: 1 core sleep before midnight to gain as much SWS as possible, 4 naps should theoretically only contain REM. Everyman 4 requires its core in the heart of the SWS peak (9PM – midnight) where SWS will last the longest; it must consist of almost 100% SWS in order to meet the average 90 minutes most adults require. This is highly unlikely, so some chronic sleep deprivation is expected on this schedule. Its 2hr 50m daily total cannot contain 90m of SWS and 90m of REM recommended for the average adult. While resisting adaptation, the brain will force SWS and REM wherever it can as the homeostatic pressure climbs over weeks instead of getting relieved every day. Ultimately, naps should only contain REM with a couple minutes of light sleep. SWS may creep into the last nap, however. This schedule is below the minimum sleep threshold of most people and consequently has a very low success rate. It is strongly recommended that inexperienced polyphasers do NOT attempt this schedule. Do not attempt to add 30 minutes to the E4 core. This is only likely to introduce SWS at the end of the sleep block, causing oversleeps and miserable wakes due to sleep inertia. The sleep cycle during E4 core compresses potentially to as short as 60 minutes, which seems to be caused by an extremely short core and a high frequency of naps. That means its 1.5 hour duration is actually one and a half cycles, risking mid-cycle SWS wakes until the brain adapts by placing light sleep at the trained wake time. As with uberman, any oversleeps greater than a rare 10m or so will be devastating to the adaptation process that requires both strict circadian entrainment and severe homeostatic pressure. 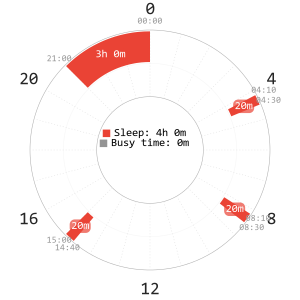 None of the sleeps in this schedule should be rotated more than 10 to 15 minutes. Mechanism: 1 core sleep before midnight to gain as much SWS as possible, 5 naps should theoretically only contain REM. Ideal scheduling: Core before midnight, naps placed in an Uberman timing fashion. This schedule is intended for people attempting to transition to Uberman while retaining an Uberman sleep rhythm. People looking for a permanent schedule should consider E4 instead as this schedule has been designed with the pure purpose of providing transition from other schedules to uberman. It is strongly recommended that inexperienced polyphasers do not attempt this schedule, as this schedule is also below the minimum sleep threshold of most people. See the Uberman scheduling page for more information.